In case it had escaped your notice, it was World Toilet Day a couple of weeks ago, a United Nations associated event designed to improve sanitation around the world. 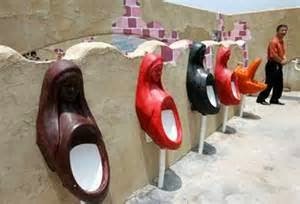 Don't worry, I missed it too, but I thought I would make up for it by sharing some of the most interesting toilet designs that you can see around the world. 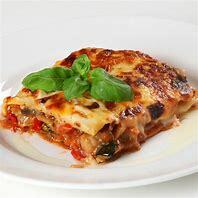 You might have you own favourite. It may feel like you’re entering an underground station when you head toward these toilets along the Graben (one of Vienna’s most famous streets), but these are actually lovely. Vienna didn’t always have the best track record when it came to public bathroom options, but a proposal from Wilhelm Beetz helped change that in the late 19th century. In these bathrooms, which are near Kohlmarkt, you’ll have attractive lavatories, brass fixtures, marble walls and wood panelling, as well as some attractive work. The men’s side features waterless urinals. Perched 14,200 feet up on Alaska’s Mount McKinley, this stands on its own surrounded by nothing more than three wooden slabs and plenty of ice and snow. Hiking here is not easy, and there’s still more than 6,000 feet to go from here to reach McKinley’s summit. Largely open to the elements, this lavatory offers a novel experience and the view of Mt Foraker to help you forget about subzero temperatures. Some visitors stop here not for a loo stop, but just to take pictures. Located along State Highway 1 in the rural area of Kawakawa in the North Island, these public lavatories were designed by late artist-architect Frederick Hundertwasser. 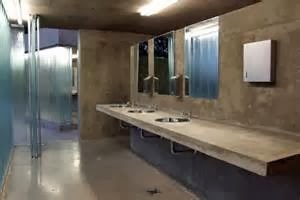 Built in the late 1990s, these bathrooms feature bricks from a former Bank of New Zealand building, a living tree, tile mosaics, curvy columns and walls embedded with glass bottles. The facility also has a grass roof. 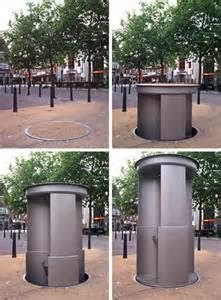 Places like London and Amsterdam are curbing public urination with a futuristic solution - toilets that emerge from the ground during the nighttime hours then retract and disappear during the day. A company called Urilift is producing these cylindrical lavatories. They’ve started with walk-in urinals and have now moved on to pop-up loos with doors for the ladies. Other types of portable urinals have also been popping up across Europe for more than a decade. From the people who brought us Toto, one of the world’s high-end toilet brands, come the commodes of the Daimaru Department Store. The public bathrooms here are outfitted with, yes, Toto toilets. 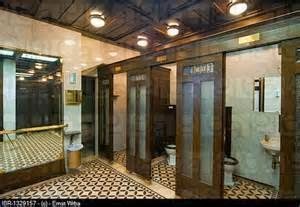 The shopping destination has 13 floors, each of which has its own bathroom designed to match the floor’s atmosphere. 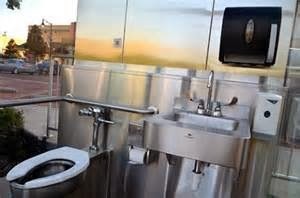 These aren’t your standard toilets, though: they have everything from heated seats to sound effects (to mask typical bathroom noises), and feature a self-cleaning mechanism complete with temperature-controlled water. Widely known as the largest public restroom in the world, this facility in Chongqing is impressive in numbers alone: four stories of about 1000 toilets spread across more than 32,000 square feet. Now, that’s a big bathroom. But the intrigue doesn’t stop there — the toilets here range in design from curvy women to open crocodile mouths. The bathroom even features one group of open-air stalls and entertainment options such as calming music and TV shows. In 2012, Sulphur Springs introduced a pair of glass bathrooms in its downtown square. 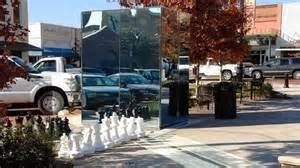 From the outside, these appear to be a mirrored cube, but step inside and you’ll discover these walls are made of a one-way glass that allows those on the inside to look out, giving you the feeling you’re doing your business in front of anyone and everyone who passes by. The walls work, in part, through an imbalance of light — the light outside must be brighter than it is inside, so LED lights have been set up outside to keep the magic alive at night. The toilets came as part of a general revamp of Sulphur Springs’ downtown area and they were inspired by an installation in Switzerland by the artist Monica Bonivicini. 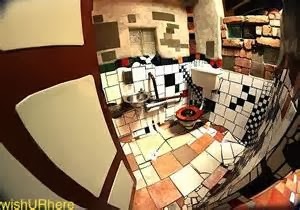 The lavatories may not be the main draw of these elaborate themed bathrooms at the Chung Yo department store in Taiwan, where there’s a Coca-Cola bathroom, a “Wizard of Oz” bathroom, a secret garden-themed lavatory and a “Finding Nemo” loo. But the bathroom that really gets people talking is a men’s room that is much more than just a place to pee. 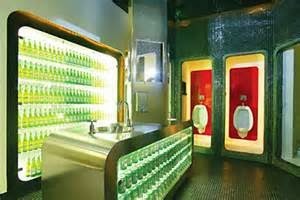 This bar-bathroom combo features refrigerators stocked with Heineken for those who’d like to take a leak and a swig of beer at the same time. The men’s bathroom on Rothesay Pier was commissioned by Rothesay Harbour Trust in 1899. 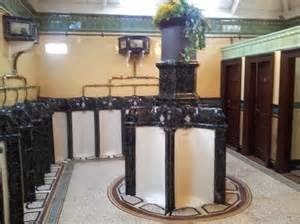 Retaining its Victorian-era charm, the bathroom is covered in elaborate ceramic tile work and features white enamel urinals topped with marble - 14 of them line the walls and six more act as a centrepiece of sorts, circling a stand in the middle of the room. The crest of the Royal Burgh of Rothesay sits at the restroom entrance. Much of the equipment, which originally came from Twyfords Ltd. Glasgow, is still here. It was restored in the 1990s, when showers, women’s toilets, as well as facilities that cater to children and people with disabilities were added.